Andre's Fortress: 2018 World Cup Qualifiers: Socceroos in trouble? Australia could be in a difficult position come April of this year. Assuming the Socceroos do top their World Cup Qualifying Second Round Group B or place as one of the 4 best runner-ups throughout all groups, that isn't the end of the story. The seedings as at 7 April 2016 will determine the formation of the final Third Round Groups. The top two teams in Asia will be seeded in Pot 1 (Iran and Japan now); teams ranked 3 and 4 (South Korea and Saudi Arabia) will be seeded into Pot 2 and so on. As it stands, Australia will be seeded in Pot 3, which creates the very dangerous and real prospect that Iran/Japan and Korea could be in the same group as Australia. Now remember, only the top two in a given group AUTOMATICALLY* qualifies for the World Cup. To be told that one of the Asian giants in South Korea, Japan or Australia could potentially* be out of the World Cup 2018 is unthinkable! *There is of course a last-chance third place and the intercontinental playoffs but that is a riskier and uncertain prospect. I did note in February 2015 that Australia really needs to maintain its Top 4 position in Asia. Of course, the rankings above are unlikely to remain stagnant given that there are some 4 games remaining in each group for this Second Round. Nor are the top 12 necessarily guaranteed to go through. 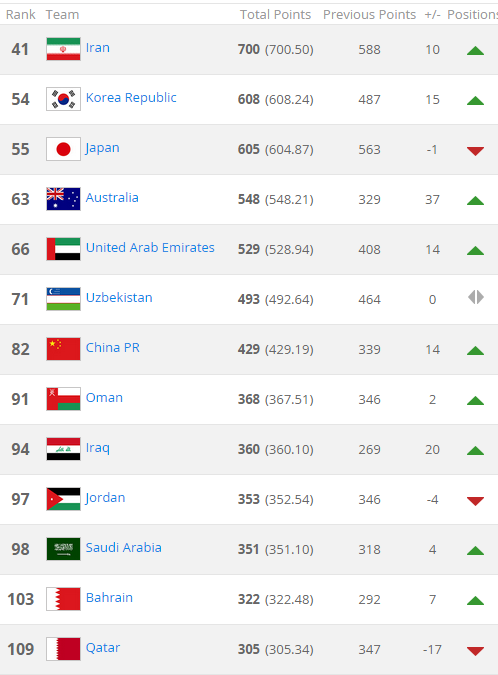 For example, Syria, and Thailand are causing some chaos in their respective groups, whilst China is underperforming even though they would qualify if we took the top 12 in Asia right now. Potentially, the hardest Third Round group, in my view, would be: Jordan, Uzbekistan, Australia, South Korea and Japan (yes Iran is arguably better equipped to deal with Australia but, given our rivalry with the Blue Samurai, I feel the stakes are higher with Japan in the mix). 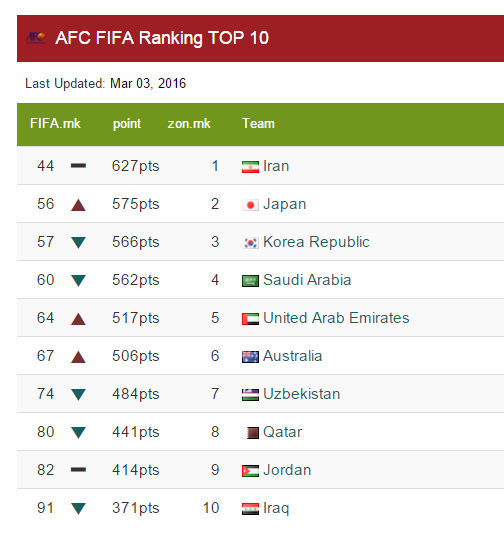 If we look at the rankings in February 2015, Australia shot up to 4th place after its Asian Cup triumph. What could possibly be the explanation for Australia's drop to 6th place? Perhaps Saudi Arabia and UAE have played more games than Australia? At any rate, as they say, to be the best, you have to beat the best. Even if the nightmare scenario discussed above does come to fruition, no doubt it is also important to remember that South Korea/Japan/Iran will be annoyed that Australia is in their group because the Socceroos do make tough physical opponents, at least by Asian standards. A good team will not panic when they see the draw - a good team embraces the challenge and rises up to it. 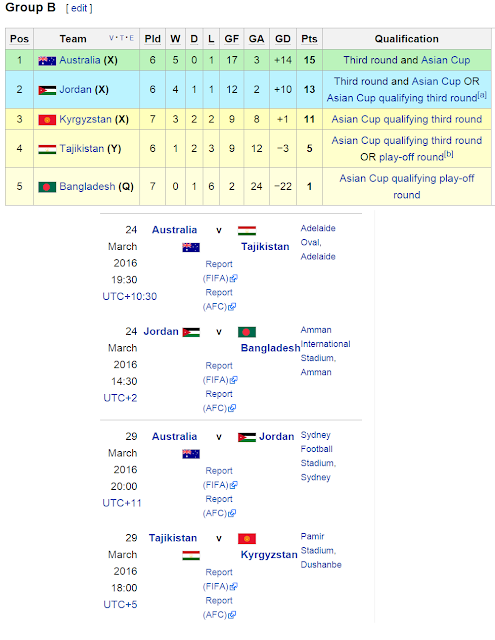 For the time being, Australia should just focus on Tajikistan on 24 March 2016 and Jordan on 29 March 2016. Scraping through the next round of qualifying is of course the minimum priority (1 win against Tajikistan and then 1 draw with Jordan); however, 2 wins could go a long way towards raising our ranking to the top 4 in Asia. That being said, perhaps the gap between 4th and 6th is already too hard to bridge, and to a large extent, any shift in rankings is heavily dependent on the performances of other nations. Tajikistan in theory should be "easy." Of course, on one hand, we all know how difficult it is to play in Central and Western Asia (who can forget the tough matches against Bahrain, Saudi Arabia and Jordan away in qualifying campaigns gone past?!!). However this match is at home so we don't really have that travelling problem to worry about. 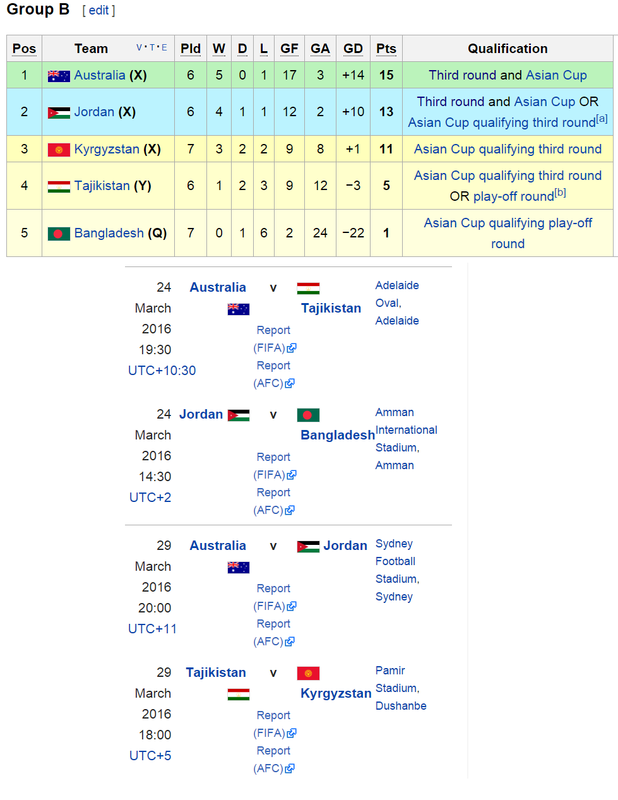 Jordan is strong at Amman (I expect them to thrash Bangladesh at least 4-0) but if playing on Australian soil they should theoretically be weaker. But talk is cheap. We can only wait and see..